Pony 411 Episode 146- What's Your Rank? Hey there, listeners! Episode 143 is here! It's a bit short, but that's fine. It still has news! Some of it includes fan games, some collectibles, and lawyers ruining stuff! And more! Sup, listeners? Episode 142 is here! Because of the craziness of Everfree Northwest last week, we have two weeks worth of news this time around. Some of it includes an Extra Credits video, unreleased toys, chocolate bars (?? ), and movie news! There's more, but you'll have to listen to find out! The final part of episode 141! But instead of talking about Everfree, we talked about the new episode, "A Hearth's Warming Tail!" Oh, and the newest comic issue, Friendship is Magic #42. Part 3 of our Everfree Northwest experience! We talk about the last few panels we attended, and some of the news that they dropped for next year! Part 2! More panels! Some of them ridiculous! Also, we bought stuff! The first part of our Everfree Northwest 2016 experience! Hello there! Welcome to episode 140! We have a small amount of news this week. Some of it includes con announcements, a blooper, several new episodes, and a bit more. Not a lot more, but a bit. Hey, we're back! And we bring episode 139 with us! And it's a large one. And a big chunk of it is from the news. Like a ton of con announcements, a bunch of toy images, some new episode synopses, movie news, and far more! IT'S FINALLY HERE! But we'll get to that later in episode 135. We do have some news to get through first. Like the usual convention guests, a real Sweetie Bot (?! ), details of upcoming Friendship is Magic episodes. And quite a bit more! Welcome to episode 134! The last one of the hiatus! In the news, we have an alarming amount of con announcements, some fan game stuff, new toys, and more! Like season 6 starting this month! YEAH! New Channel, Pony 411 Plays! We've started a new channel for games! 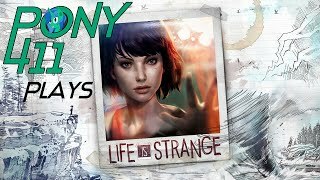 We're starting with Life is Strange. Go check it out! Pony 411 Episode 129- Best Episode Ever?